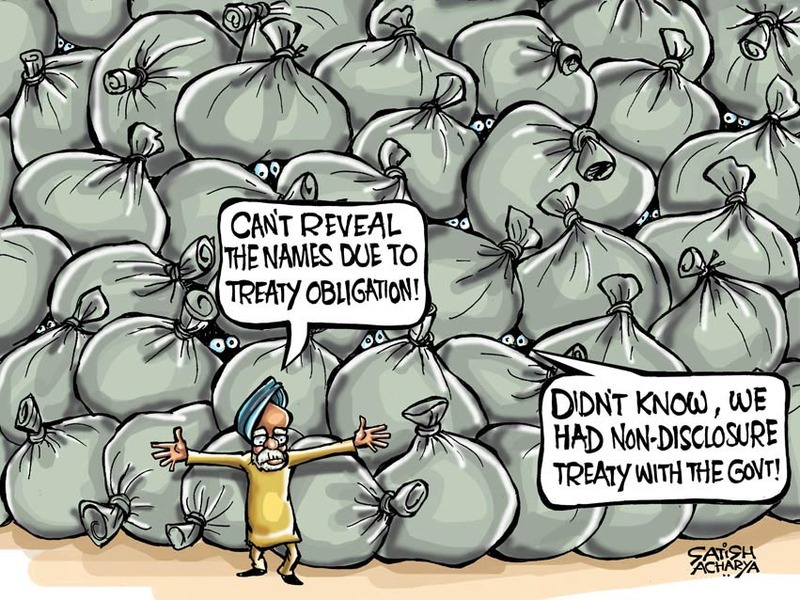 BJ's nocabbages: Black Money Abroad: Can we get it back? According to the latest official data released by the Swiss National Bank (SNB), Switzerland’s central bank, the money Swiss banks owed to Indian clients at the end of last year was 1.42 billion Swiss francs (about Rs9000 crore). This amount is about 35% lower than the 2012 figure of 2.18 billion Swiss francs held by Indians in Swiss banks. Now compare this with the quantum of funds held by Indians in Swiss banks in 2006: a mind-boggling 6.5 billion Swiss francs (over Rs41000 crore). Please note that this is the illegal booty stashed away in Swiss banks only. It can only be a matter of conjecture as to the total size of the illegal monies kept in secretive bank accounts in tax havens around the world, like Canary Islands and Gibraltar. As you can see, the amount of black money has been coming down in the last few years. It is likely that Indian account-holders (of black money) in Swiss banks may be withdrawing their monies to deposit them in other tax havens, like Bahamas and Liechtenstein. One major reason behind this fall is the rise in proactive government action against such black money. The U.S. Government has in the past fined UBS, a leading Swiss bank, a record U.S.$780 million. In fact, to avoid indictment, UBS also turned over names of 4000 American clients who had black money accounts. This also helped the U.S. authorities pursue other banks; it is helpful to know that Wegelin & Co., Switzerland’s oldest bank, with no U.S. offices or personnel, was indicted, which soon led to its closure, ending a nearly 275 year run. The SNB figures come at a time when Switzerland-based banks are facing growing pressure from several nations, like the U.S. and Germany, to share client details of their nationals. It is important to bear in mind one important fact: SNB’s figures (described as ‘liabilities’ of Swiss banks towards their clients from India) do not indicate the quantum of the much-debated alleged black money held by Indians in the safe havens of Switzerland. In fact, SNB’s official figures do not even include the money Indians or others might have in Swiss banks in the names of others. While the Government of India often talks about unearthing black money held in secretive bank accounts, including with some of the world’s leading commercial banks like UBS, there has been no visible work toward recovering such illegal monies. Amid allegations of Indians stashing illicit wealth abroad, including in Swiss banks, the Government of India (GoI) has said it is exploring all avenues to recover black money hidden abroad; in case of Switzerland, the GoI has signed a treaty for sharing of information on issues related to tax crimes. One major reason for the massive fall in hidden wealth is the growing international pressure on Swiss banks to come clean on the name of the clients who have hidden their ill-gotten wealth in those banks. The Economist writes that, “The Swiss government has been seeking an agreement with America that would allow the industry to pay its way out of trouble in one go. Instead, it has had to make do with one covering banks that are not already under investigation, which excludes some of the country’s biggest institutions. The U.S. Government’s approach toward recovering illegally held monies begets one pertinent question: Why can not the Government of India adopt a similar approach? Why can’t it pursue extraordinary measures to recover the hidden wealth held by Indians, belonging to the political and business classes, in Swiss banks and in other tax havens? If the U.S. and Germany could do it, why can’t India do it? A couple of years back the Supreme Court chided the GoI for its evasive action on the recovery of black money. Let me cite some excerpts of the SC judgment on the issue. “The worries of this Court relate not merely to the quantum of monies said to have been secreted away in foreign banks, but also the manner in which they may have been taken away from the country, and with the nature of activities that may have engendered the accumulation of such monies. The worries of this Court are also with regard to the nature of activities that such monies may engender, both in terms of the concentration of economic power, and also the fact that such monies may be transferred to groups and individuals who may use them for unlawful activities that are extremely dangerous to the nation, including actions against the State. “Consequently, the issue of unaccounted monies held by nationals, and other legal entities, in foreign banks, is of primordial importance to the welfare of the citizens. The quantum of such monies may be rough indicators of the weakness of the State, in terms of both crime prevention, and also of tax collection. Depending on the volume of such monies, and the number of incidents through which such monies are generated and secreted away, it may very well reveal the degree of “softness of the State. “The amount of unaccounted monies, as alleged by the Government of India itself is massive. The show cause notices were issued a substantial length of time ago. The named individuals were very much present in the country. Yet, for unknown, and possibly unknowable, though easily surmisable, reasons the investigations into the matter proceeded at a laggardly pace. Even the named individuals had not yet been questioned with any degree of seriousness. These are serious lapses, especially when viewed from the perspective of larger issues of security, both internal and external, of the country. 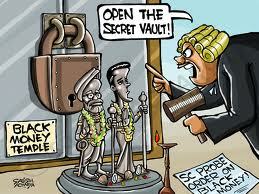 The SC verdict exposes the hollowness of the government's proclaimed intent of recovering black money stashed abroad. I think it boils down to one simple thing: political will. And as we know, in our country, there is simply not enough political will to punish the law-breakers. What else can we expect from a government which itself in embroiled in a slew of scams and which goes to great lengths to protect its corrupt ministers/leaders/MPs/MLAs?